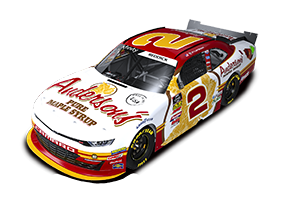 Anderson's Maple Syrup, Inc. and Nascar Camping World Truck Series team Joe Denette Motorsports will be teaming up for 5 races in 2012, beginning with the season opening race on February 24 at the Daytona International Speedway in Daytona Beach, FL. Anderson's Maple Syrup will be reunited with four-time NCWTS champion Ron Hornaday, with the race being broadcast live on SpeedTV. Making his ninth start at the 2.5-mile superspeedway after qualifying in the 12th position, Hornaday practiced patience before making a charge to the front of the field with 20 laps to go. With three attempts at a green-white-checker finish, the veteran driver would hold on to a top-15 position in a last-lap shoot-out that ended in a three-truck accident in the tri-oval. While the No. 9 Anderson's Maple Syrup Chevrolet suffered damage on the last lap of the 109-lap event, Hornaday was able to finish 14th, his fourth top-15 finish at the "World Center of Racing". Click here to listen to the official announcment as broadcast on Sirius XM. Click here to listen to Ron's pre-race interview on Sirius XM.